Coppermine Photo Gallery is a picture gallery script. Users can upload pictures with a web browser (thumbnails are created on the fly), rate pictures, add comments and send e-cards. 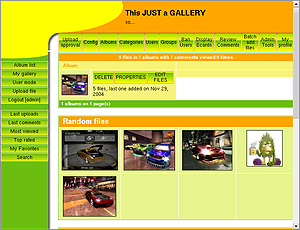 The admins can manage the galleries and batch add pictures that have been uploaded on the server by FTP. Support for multimedia files has been added recently. Images are stored in albums and albums can be grouped by categories. The script supports multiple users and each user can possibly have its own set of albums. The script also supports multiple languages and has a theme system. It uses PHP, a MySQL database and the GD library (version 1.x or 2.x) or ImageMagick to make the thumbnails. An install script makes the installation fast and simple.